•Fast: Cable ties are installed quickly with one easy trigger depression, increasing productivity while decreasing labor costs. •Reliable: HellermannTyton's automatic cable tie systems have been tested to perform extremely consistently, without interruption to workflow. •Ergonomic: The ergonomic design of the automatic cable tie tool systems feature a comfortable grip, low weight, and easy trigger depression to reduce installer effort and strain while installing cable ties. •Providing Valuable Operator Feedback: Equipped with a self diagnostic LCD information screen, the automatic cable tie system easily guides the user through the cycles of cable tie installations. •Flexible Manufacturing Versatility: HellermannTyton's cable tie tool systems support principles of flexible manufacturing requirements and environments. •Uniform Fastening Quality: HellermannTyton's automatic cable tie systems feature adjustable tension control to deliver consistent levels of cable tie fastening. •Range: HellermannTyton offers the widest range of automatic cable tie tool systems which cover cable tie tensile strengths of 18, 30 and 50 pounds with bundle diameters between 1/16" to over 3". •Fast: Cable ties are installed quickly with one easy trigger depression, increasing productivity while decreasing labor costs. •Reliable: HellermannTyton's automatic cable tie systems have been tested to perform extremely consistently, without interruption to workflow. •Ergonomic: The ergonomic design of the automatic cable tie tool systems feature a comfortable grip, low weight, and easy trigger depression to reduce installer effort and strain while installing cable ties. •Providing Valuable Operator Feedback: Equipped with a self diagnostic LCD information screen, the automatic cable tie system easily guides the user through the cycles of cable tie installations. •Flexible Manufacturing Versatility: HellermannTyton's cable tie tool systems support principles of flexible manufacturing requirements and environments. •Uniform Fastening Quality: HellermannTyton's automatic cable tie systems feature adjustable tension control to deliver consistent levels of cable tie fastening. •Range: HellermannTyton offers the widest range of automatic cable tie tool systems which cover cable tie tensile strengths of 18, 30 and 50 pounds with bundle diameters between 1/16" to over 3". HellermannTyton's ATS3080 automatically installs cable ties for bundles up to 3.14" in diameter with one trigger depression. This innovative system utilizes strap and closures (ordered separately) to achieve a waste free system. The ATS3080 uses only the required strap length for the diameter. The strap is outside serrated so that it will not damage sensitive wires and cable bundles. This well-balanced tool has ergonomic benefits that include low weight and a comfortable hand grip which reduce operator strain and injury while installing cable ties. 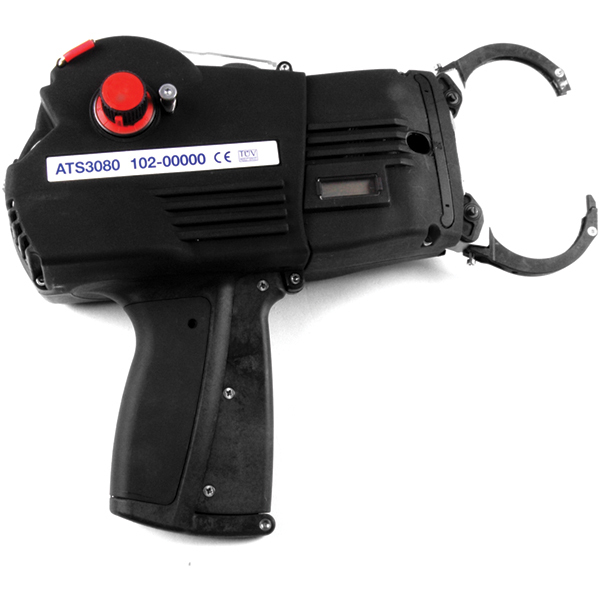 The ATS3080 possesses an LED panel which makes it easier to maintain and operate the tool. The ATS3080 has three jaw diameters available; 1.18" (30mm), 1.96" (50mm), 3.14" (80mm). After the jaws are easily interchanged, further tool adjustment between the three jaw diameters is unnecessary.